Our company began in 1990 with the start-up of a small chipping plant in north-central British Columbia, Canada. 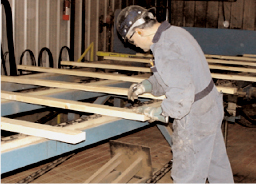 By 1994, as markets created stronger demand for structural engineered wood products, we established our first fingerjoint line in Mackenzie, BC, manufacturing vertical use studs for the North American home construction market. Today, our Mackenzie operations are running at full capacity and plans are under way to install a third line at this location. 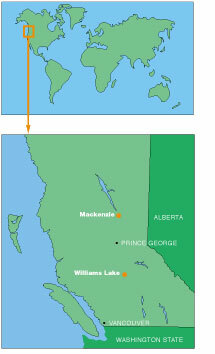 A second line started up at Williams Lake, BC, in February 2002, and now runs three shifts a day. Our expansion activities underline our commitment to growth and assurance of supply to our customers. At Parallel 55, we begin by selecting high quality raw materials, and we finish with higher quality, value-added studs ready for shipment to our customers throughout the North American homebuilding industry, and to Japan. Our people are the key to our success. We have an outstanding workforce - well trained, highly skilled and dedicated to quality control, every step of the way. We know what our customers want. And our dedicated team delivers. Every day. Superior products. Exceptional Service. That is our promise at Parallel 55.